Third Party and Independent Daily's News Pages (in the left sidebar) are shared Google Reader pages aggregating news and blog items from across the political web. Each page synthesizes at least three feeds: a news search, a blog search and, when possible, at least one authoritative source on the given topic. • The Constitution Party page integrates news and blog searches for 'Constitution Party,' as well as feeds from the party's discussion forum and Twitter page. • The Green Party page integrates news and blog searches for 'Green Party' as well as feeds from the Green Party's press page and Green Party Watch. 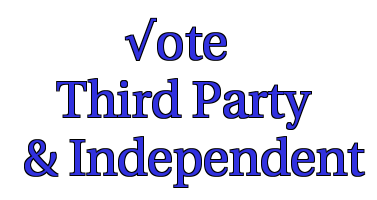 • The Independents page aggregates news and blog searches for the terms "independent voter" and "independent candidate." • The Libertarian Party page integrates news and blog searches for 'Libertarian Party' as well as a feed from the Libertarian Party blog. • The Modern Whig Party page integrates news and blog searches for 'Modern Whig Party' as well as feeds from the party's official blog and Twitter page. • The Pirate Party page integrates news and blog searches for 'Pirate Party' as well as the feed from the party's official blog. • The Socialist Party page integrates news and blog searches for 'Socialist Party USA' as well as the feed from The Socialist Webzine. Good question. One of the main problems is that the automatic feeds cannot discriminate between items mentioning the historical Boston Tea Party and items about the political party (or at least, I have yet to figure out how to make a feed do so). Plus the political party does not get that much press, so, in an automatic feed, stories about it are kind of lost in the flood of unrelated articles that happen to mention the historical Boston Tea Party. This is also something of a problem for the Pirate Party news feed, which often picks up articles talking about how to throw a "pirate party" for your child's birthday or things along those lines. But because there aren't that many of the latter stories, and because the Pirate Party is international in scope, and so gets a fair amount of press, news about the party tends not get overshadowed or crowded out by the other items.